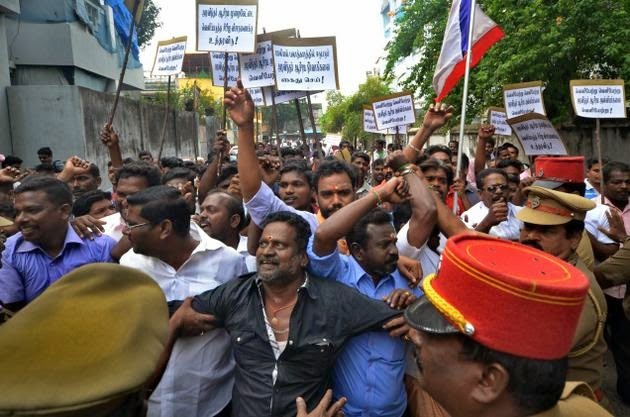 For the second consecutive day, various outfits continued to be on the agitation spree, staging protests, blocking roads, and throwing stones, condemning the management of Sri Aurobindo Ashram and the police for the death of two sisters expelled from the Ashram and their mother. Five sisters were evicted from Sri Aurobindo Ashram-run Ambabhikshu apartments at Vazhaikulam on a Supreme Court directive. Along with their parents, they attempted to commit suicide. The mother and two sisters embraced death while four others were rescued. The death of the three women kicked off a series of violent protests by various political and social organisations on Thursday. As a fall-out, on Friday around 200 residents, including women, assembled before Ambabhikshu Apartments and tried to enter the premises. The police stalled them and so the protestors pelted stones on the apartment. The police and protestors were pulled, pushed and dragged for sometime on the road before the apartment. The protestors moved towards the Ambour road and staged a road blockade. P.Anand of Vazhaikulam Residents Welfare Association said that whoever wished to join the Ashram should bequeath their property and pay the cash in advance. The family too might have adopted that way only. The sisters were allegedly subjected to sexual harassment, and to them, it would have appeared that they failed to get justice and were driven to end their lives. The trustees of the Ashram should be held responsible for the death of three persons, the Ashram sealed and taken over by government. Around 100 activists of Nam Tamizhar Iyakkam, Puducherry unit staged a demonstration in front of the Sri Aurobindo Ashram demanding that the government take over the administration of Ashram. They were arrested and removed from the spot. Vijayalakshmi, co-ordinator of Nam Tamizhar Iyakkam, Puducherry unit, said mysterious deaths and sexual harassments allegedly had been occurring in the Ashram and now three women had committed suicide. The trustees should be held responsible for incidents and the government should take control over the Ashram. Around 1,000 students of Government Polytechnic for Women and Motilal Nehru Government Polytechnic, Lawspet boycotted the classes and took out a procession. They blocked the road at East Coast Road junction for more than 45 minutes. The office-bearers of the Students Federation of India also took part in the agitation. They also raised slogans demanding action against the trustees of Ashram. Later in the day, miscreants exploited the situation to vandalise an eatery situated near the Chief Secretariat.